Former New York Giants running back Tiki Barber's relationship with the team quickly soured after he retired in 2006 but the two sides appear to be patching things up. Barber was very critical of the Giants, especially then-head coach Tom Coughlin, after his playing career ended. He once publicly called for Coughlin to be fired. Barber also said that his coaching style drove him to retirement. In 2012, Barber attempted to meet with Coughlin to make up with his former coach but Coughlin reportedly declined to meet with him. In November 2011, Barber wrote a column declaring the fall of the Giants. However, the team ended up winning the Super Bowl that season. 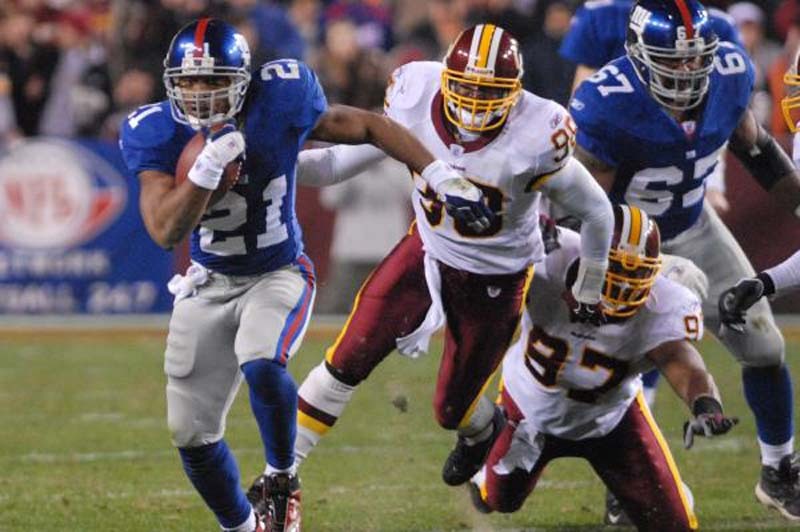 In 2013, he was critical of former Giants running back David Wilson's fumbling problems. Barber himself had trouble holding on to the ball early in his career. Though it appeared Barber's relationship with the Giants was damaged forever, new head coach Pat Shurmur recently contacted Barber in an attempt to repair that damage. "I reached out to him," Shurmur told the New York Post. "I wasn't here for all that. I'm walking into this thing with fresh eyes. He was an outstanding player. I remember he found a way, he kind of had the fumbling thing going and he found a way to fix it, which I was impressed by." Barber told the Post he was happy to have that conversation with Shurmur. "When he called me out of the blue, it was shocking in a sense but it was welcome," Barber said. "We had a great conversation. I was taken by how calm he is and how measured and thoughtful he is, which resonates really well with me, because that's how I am." The Giants are coming off a terrible 3-13 season with one of the worst offenses in the NFL. However, the team is optimistic the return of wide receiver Odell Beckham Jr. from injury and the drafting of former Penn State star running back Saquon Barkley will significantly improve the offense.